The simulation of flow in porous media is a computationally demanding task. Thermodynamical equilibrium calculations and complex, heterogeneous geological structures normally gives a multiphysics/multidomain problem to solve. Thus, efficient solution methods are needed. The research simulator Athena is a 3D, multiphase, multicomponent, porous media flow simulator. A parallel version of the simulator was developed based on a non-overlapping domain decomposition strategy, where the domains are defined a-priori from e.g. geological data. Selected domains are refined with locally matching grids, giving a globally non-matching, unstructured grid. In addition to the space domain, novel algorithms for parallel processing in time based on a predictor-corrector strategy has been successfully implemented. 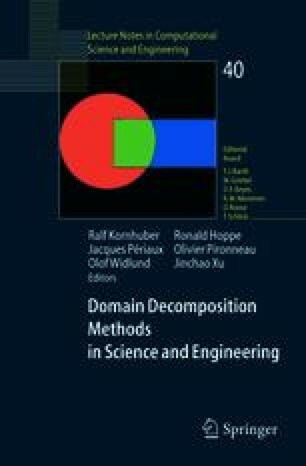 We discuss how the domain decomposition framework can be used to include different physical and numerical models in selected sub-domains. Also we comment on how the two-level solver relates to multiphase upscaling techniques. Adding communication functionality enables the original serial version to run on each sub-domain in parallel. Motivated by the need for larger time steps, an implicit formulation of the mass transport equations has been formulated and implemented in the existing parallel framework. Further, as the Message Passing Interface (MPI) is used for communication, the simulator is highly portable. Through benchmark experiments, we test the new formulation on platforms ranging from commercial super-computers to heterogeneous networks of workstations.